Some ideas for beer recipes have a convoluted genesis and a complex back story, one that involves many months treading back and forth between people and keeps busy minds awake at night. This is not one of those beers. Quite the opposite, actually. It ostensibly came about because of a throwaway comment across the brewery floor from one of the Grifter guys about how much they liked their local Tiki bar and how cool it would be to launch a beer there. 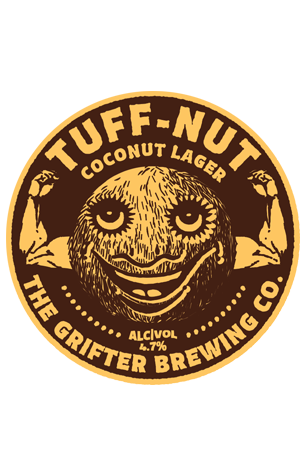 So they came up with Tuff-Nut, a coconut lager. That’s not an adjunct and style combination that immediately springs to mind nor would seem to make much sense, but it clearly did to the brewers because not only did they make it, they made it work. While the selling point is clearly the coconut (that of the flaked variety, toasted in the oven belonging to their friends around the corner at Two Chaps) it’s not the be all and end all of the beer. Yes, you get the characteristic coconut aroma, a little of its flavour and some of the oiliness but the palate reasonably swiftly turns back towards convention as Northern Brewer and Motueka hops give it a light limey character balanced with a good level of bitterness. As with the brewery’s Serpent’s Kiss watermelon pilsner, which started off as an odd idea but has become one of their biggest sellers, the key to the brewers unlocking the potential in this Tuff-Nut was being judicious with the additions; enough that you notice the difference, not so different that you couldn’t drink more than one.